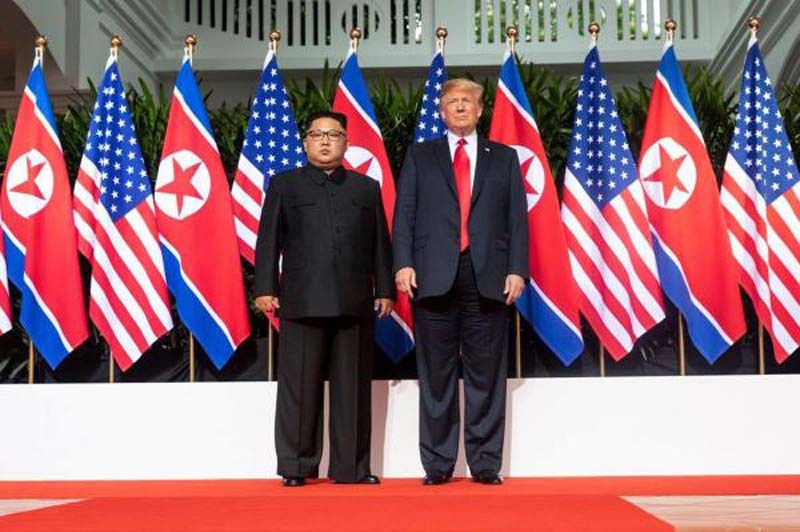 President Donald Trump's negotiations with Kim Jong Un paves the path to diplomacy, but doubts remain among experts whether the joint statement signed Tuesday in Singapore provides a guarantee Pyongyang will comply with U.S. requirements for denuclearization. Bill Richardson, the veteran North Korea negotiator and former governor of New Mexico, said during a phone briefing on Tuesday the summit achieved a personal connection between Trump and Kim. "We're on a path to diplomacy, rather than military confrontation, an easing of tensions on the Korean Peninsula, because of this historic summit, the personal connection of the two leaders," the former U.S. envoy to the United Nations said. "Another positive would be the fact that there's a process starting, a process of continued negotiations." The talks open up opportunities but the work has begun, not concluded, contrary to perceptions the summit is the final destination on the route to peace. "The next steps should be ministerial meetings, working group meetings next week," said Tom Countryman, former U.S. assistant secretary of state for international security and non-proliferation. "You've got to take advantage of this momentum." During his press conference in Singapore following the signing of the joint statement, Trump praised Kim for taking the "first bold step" for his people, proof "real change is indeed possible." "Chairman Kim, as soon as he arrives [in Pyongyang], he will start a process that will make his people very happy, very safe," Trump had said in Singapore. But the joint statement shows little evidence North Korea is guaranteed to change its provocative behavior, according to Richardson. "No specifics, no meat on the bones on the most important topics, the nuclear and ballistic missile negotiations," the former negotiator said, adding the very limited discussion of human rights was also an unfortunate move. Gary Locke, a former U.S. ambassador to China and past governor of Washington state, told UPI the relative absence of human rights from the joint statement is understandable in some ways. "With respect to human rights, the whole point, the priority of this meeting was on denuclearization of the Korean Peninsula and making sure we have verifiable denuclearization," Locke said. "The president said he brought it up, we don't know to what extent he did. Let's just hope that in the future meetings we can have more concrete steps toward that." Trump admitted North Korea's rights record is a "rough situation," but then shifted the focus to bringing home the remains of U.S. soldiers from the Korean War. "It's great that we are talking about bringing back the remains of our military from the Korean War, but what about the tens of thousands of people who are imprisoned and suffering in North Korea?" Locke said, referring to the wide networks of prison camps in the state that keep dissidents, and their families, out of sight. Richardson, who helped negotiate the release of the first American civilian to be held captive in North Korea, said Trump also made an inappropriate move by suggesting an end to joint drills with South Korea. "[Another] unfortunate concession on the part of the United States was suspending the military exercises with South Korea, especially without consulting our ally South Korea," Richardson said. "This was unfortunate but this is typical of the North Koreans. They always want you to go first in a negotiation. Then, it's their turn and they hold off. They never say yes or no. This is typical of their negotiation." But Richardson also said U.S. Secretary of State Mike Pompeo should be credited for his diplomatic efforts. "I also credit Secretary Pompeo for his diplomacy, for going to North Korea twice, by salvaging the summit with Kim Yong Chol, the No. 2 member of the Workers' Party," the former ambassador to the United Nations told UPI. "I hope the president lets Secretary Pompeo lead these negotiations. There are too many cooks in the kitchen, too many messengers within the administration." Richardson added heavy rhetoric and insults do not help North Korea policy and that he was specifically referring to national security advisor John Bolton and Vice President Mike Pence, "who both made unfortunate statements on the Libya issue," as the reason why Pompeo, and no other senior official, should serve the exclusive role of messenger. But the former governor, who made a "private, humanitarian" mission to North Korea with Google chairman Eric Schmidt, also said the North Korean leader is different from his predecessors. "My sense is that Kim Jong Un has a broader vision than his father, even his grandfather," Richardson said. "I negotiated with [father] Kim Jong Il's subordinates, with the foreign ministry, under his direction, and he was like a rug merchant." Richardson said under Kim Jong Il political prisoners would be released on the grounds a high-profile figure, like former President Bill Clinton, "come and ask for them." "I think Kim Jong Il was interested in foreign assistance and handouts, mainly humanitarian assistance," Richardson said. "I'm not criticizing it but I think Kim Jong Un's vision is more of a rebuilding his country economically through investment, through new energy grids, through infrastructure, through a more private sector vision." Both Trump and Pompeo have said they are open to investing in a future North Korea but ruled out assistance, which "failed" under past administrations. In Singapore the president said North Korea has "great beaches" where "great condos" could be built, and that the North Koreans "really enjoyed" a video the United States prepared, envisioning a prosperous and peaceful North Korea that focuses on raising living standards for its people. Such talk may be premature, however. Daryl Kimball, executive director of the Arms Control Association hosting the phone briefing, said the two sides still may not be on the same page. "It appeared as though there were differences between the North Koreans and the Trump team regarding the pacing and the sequence of the action-for-action steps that each side had been talking about," Kimball said. "So the fact that the summit communiqué is brief, with major points and goals, without these details, it could reflect the fact that the two sides are still not on the same page regarding the pacing and the sequence of the action for action steps each side is looking for."